Summer is finally well on its way! Birds are chirping, the sun is shining, flowers are blooming, and farmer’s markets are bustling. 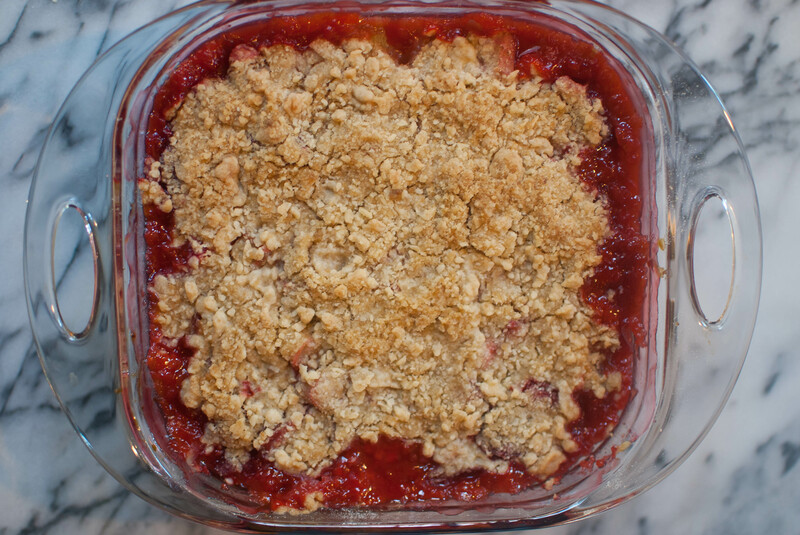 Which means it’s time to grab some of that fresh produce like strawberries and rhubarb and embrace the crumble, aka pie’s less fussy, more homey sister. 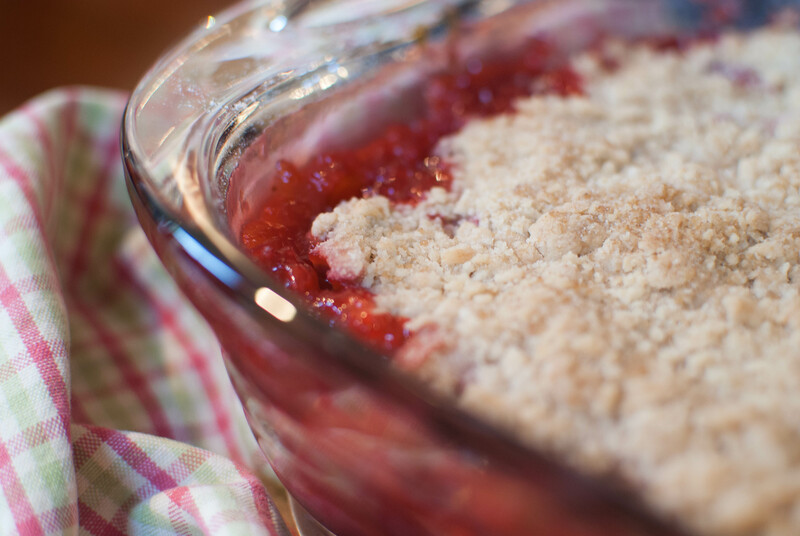 Because what’s not to love about hot, bubbling fruit topped with a buttery crumble and smothered in vanilla ice cream? If you’ve been wondering what to whip up for a quick and easy Memorial Day treat, this is definitely the dessert for you. 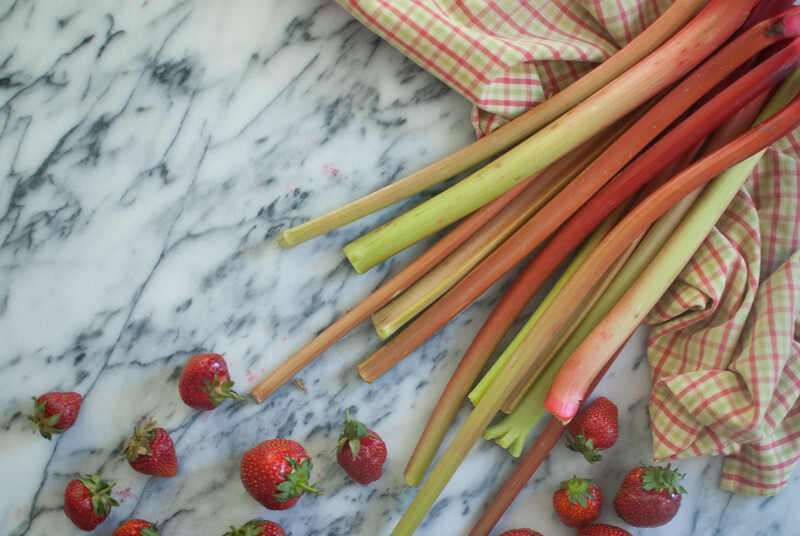 Tart rhubarb and sweet, ripe strawberries go together like peanut butter and jelly, or like me and baking. Today I chose to pair them with a touch of orange zest and juice, just to help bring out their flavor even more. Pie crust can be a bit of a hassle to prepare if you haven’t got the time, so I opted for an adaption of Four and Twenty Blackbirds’ streusel for my topping. 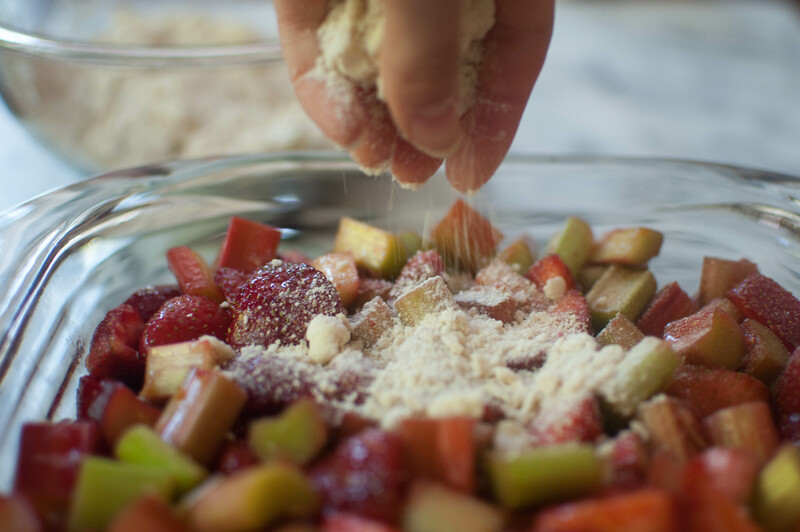 Just combine a few things, let it rest in the fridge while you throw together the filling, and sprinkle it over the fruit. 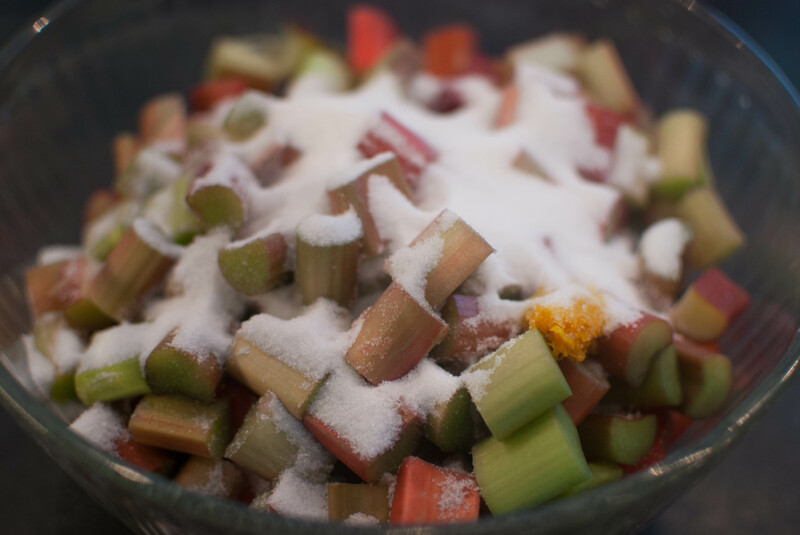 Seize the day and make rhubarb season count while it lasts! For the streusel topping, start by combining some flour, baking powder, salt, brown sugar, and white sugar in a medium bowl. Use your fingers to rub in some cubes of room temperature butter until the mixture is chunky, like this. Set it aside in the fridge for 15 minutes while you prepare the fruit! 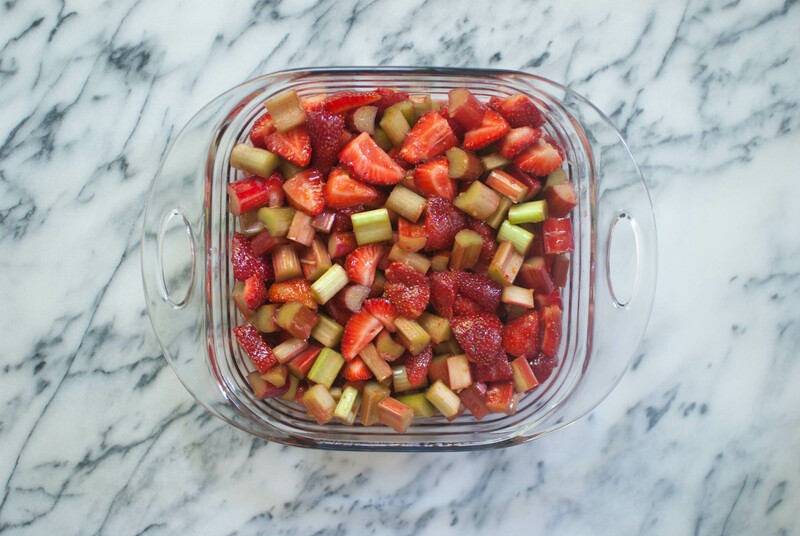 Chop up a whole lotta strawberries and rhubarb, then sprinkle on some sugar and orange zest. In a small bowl or liquid measuring cup, whisk together some orange juice, cornstarch, and vanilla, then pour over the fruit and toss to combine. 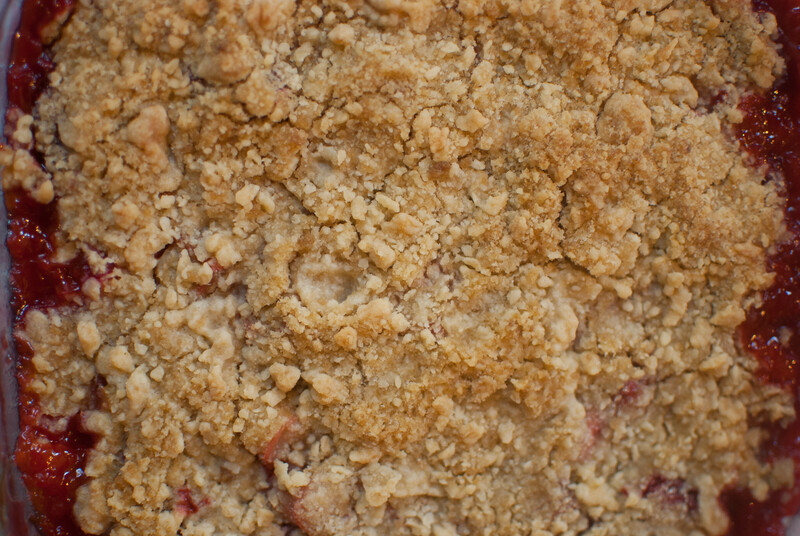 Load the filling into a deep 8×8 inch pan and grab that streusel from the fridge. Or until it’s nice and bubbly and golden, like this! Your house will probably smell heavenly at this point. Breathe it all in. Smells like spring, doesn’t it? Now take a big bite! But not before you load on a big ol’ scoop of ice cream, of course! 2. 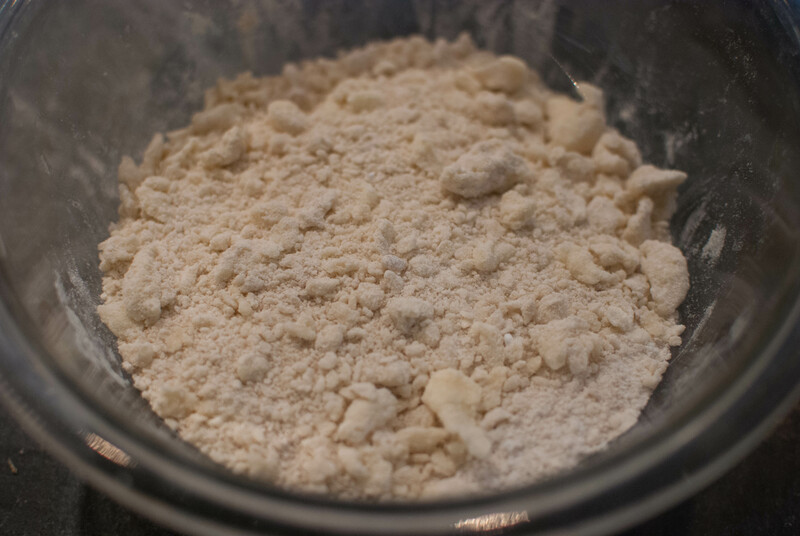 In a medium bowl, combine flour, brown sugar, white sugar, baking powder and salt. Use your fingers to rub in the butter until the mixture is chunky, but no huge blobs of butter remain. Set it in the fridge for 15 minutes while you prepare the fruit. 4. Sprinkle the topping evenly over the fruit. Bake for 45-55 minutes, until the fruit is bubbling and the topping is light golden brown. Serve with vanilla ice cream or whipped cream! Have a great Memorial Day, and happy nibbling! Ok, I will admit it. Had this last night and ate the leftovers tonight. I’d say one of the best crumbs and nibbles recipes yet. Perfect balance of sweet and tart. Served with vanilla ice cream. Yum.